The website has unique strong design aimed at attracting and maintaining visitors, whilst helping to achieve the businesses new objectives, vision and strategy. To refresh and upgrade Trico's website to suit new business objectives, vision and strategy. It was essential to bring the Trico brand to life and convey the right personality and message through the website. Our approach was to create a bold and creative website whilst still remaining aligned with the companies vision and strategy. We focused on highlighting the three main target areas of the business as the main focus point throughout the website as well as their large portfolio of projects. 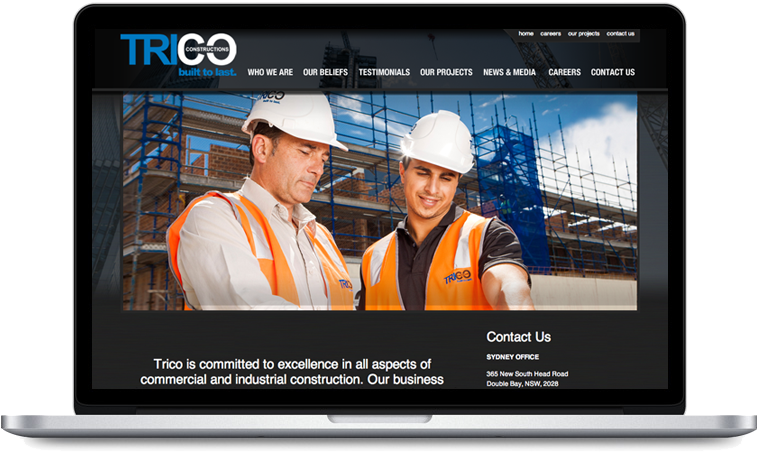 We launched Trico Constructions website in April 2013 and since it's release it has had great positive feedback from the company.